Andrew Duncan began piping at age ten. His first teacher was his mother, Ann Marie Duncan. He studied with John Cairns for over 18 years. Other major influences on his music include Bill Baird, Steve MacNeil, Greg Pearson, Joel and Angie Kimball, and Archie Cairns. Andrew won the Pipers and Pipe Band Society of Ontario’s Champion Supreme award for Grades II and I light music. Andrew has won several professional prizes in North America including the 2004 Winnipeg Knockout Championship and the 2005 John Ure Anderson Memorial Gold Medal for Piobairachd at Ligonier. He began competing with Grade I bands at age 15; including St. Thomas Police Pipe Band, Toronto Metro Police Pipe Band, and the 78th Fraser Highlanders. Andrew was a member of the highly successful Windsor Police Pipe Band Organization. As a nine year member of the Windsor Police Organization (1999-2008) he was; a member of the grades one and two bands, pipe major of the grade three band, and the primary instructor and organizer for the piping school. While competing in grade two for five years the Windsor Police Grade Two Band won three North American Championships, three United States Championships, two Canadian Championships, four Champion Supreme designations from the Pipers and Pipe Band Society of Ontario, and placed fifth, fourth, and third (on two occasions; one of which was marked by the pipe section being placed first by both piping judges) at the World Pipe Band Championships. 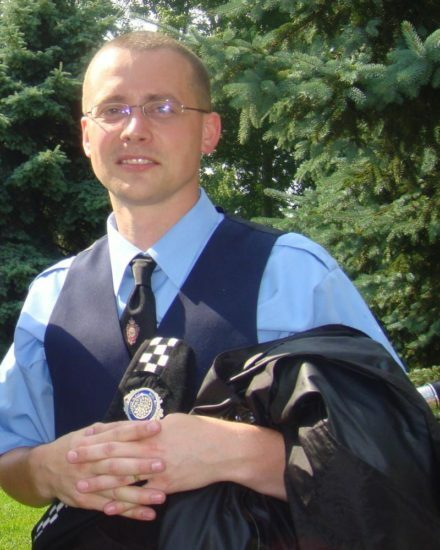 Andrew Duncan was the Pipe Major of the Windsor Police Grade Three band (2005-2006). Under his leadership the band consistently placed in the prize list and won the U.S. Pipe Band Championship in 2006. Andrew is a past president of the Windsor-Detroit Branch of the Piper’s Society of Ontario. Andrew joined The Peel Regional Police Grade One Pipe Band (2009). In 2009 The Peel Regional Police Pipe Band was consistently in the prize list and won the Medley event at the North American Championships. During the Fall of 2010 Drew passed the E.U.S.P.B.A. Graduate Exams in both light music and Piobaireachd. In January of 2011 Andrew was hired by Alma College as the Co-Coordinator of Highland Arts and Director of Piping. As the Director of Piping at Alma College Drew has grown the program to include many top amateur solo competitors. In cooperation with Christie Freestone he helped organize Alma College’s first Highland Arts Concert and workshop. The Alma College Pipe Band has enjoyed a steady stream of competitive successes since its inception in 2011. These successes include winning the U.S. Pipe Band Championship once in Grade V and three times in Grade IV. Currently Drew plays with The Great Lakes Pipe Band. Drew is the current chair of the Ohio Valley Branch of the Eastern United States Pipe Band Association. Andrew is the bagpiping coordinator for The Ohio Scottish Arts School. Between teaching piping at Alma College, teaching private students in the Alma and Metro Detroit areas, and running Duncans Highland Supply Andrew is fortunate to be engaged in piping on a full time basis.